The pope’s moral argument on global warming seems lost on Oklahoma’s U.S. Sen. Jim Inhofe, who has spent much of his political career denying the negative ramifications of mankind’s pollution of the planet’s atmosphere. The main message given in Pope Francis’s recent encyclical is not the concept of global warming itself or the huge, mounting evidence of how carbon emissions have accelerated it. The pope, along with most rational people, takes that for granted because of scientific evidence. We have come to see ourselves as her lords and masters, entitled to plunder her [earth] at will. The violence present in our hearts, wounded by sin, is also reflected in the symptoms of sickness evident in the soil, in the water, in the air and in all forms of life. The pope, of course, frames the issue on religious and moral terms, whether one agrees with the approach or not. He’s not a scientist, but he can read and understand the scientific record. Inhofe, who is widely known for calling the science underlying the impact of global warming a “hoax,” isn’t a scientist either, but he also doesn’t seem to get the pope’s message. I am concerned that his [Pope Francis] encyclical will be used by global warming alarmists to advocate for policies that will equate to the largest, most regressive tax increase in our nation’s history. It’s the poor that spend the largest portion of their expendable income to heat their homes, and they will be the ones to carry the heaviest burden of such onerous policies. The statement contains two of Inhofe’s favorite global warming fallacies: (1) Those “alarmists” will want some type of tax on carbon emissions, and (2) the poor will have to pay up. But those alarmists include highly educated scientists relying on a vast amount of scientific evidence, and there’s no reason in the world that poor people should have to pay more in taxes to reduce carbon emissions. (The pope would obviously be against hurting impoverished people.) These are the Inhofe conjectural myths we’ve endured for years now, but they miss the pope’s larger moral message. 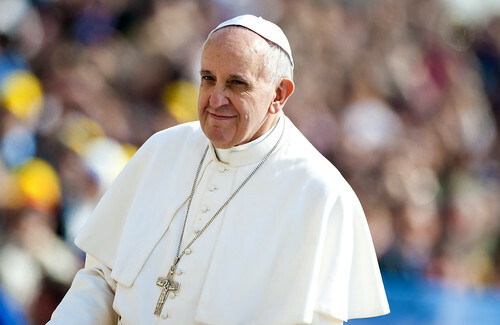 Pope to Inhofe: Polluting the planet is morally wrong and selfish. Inhofe to Pope: Taxes, poor people. To argue that there’s a disconnect here is an understatement. Obviously, Inhofe wants to repeat his tired talking points to support the oil and gas industry, which has contributed more than $1.7 million to his campaigns in his political career. The pope intentionally wants to frame the issue on a larger level of morality, which Inhofe can’t or won’t address directly. Those of us concerned about the environment and global warming can hope the pope’s message resonates and moves people to action, but as long as Inhofe and his fellow Republicans remain in power nothing much is going to happen. « Inhofe, Lankford, Mullin: A Little Help From The Feds?